Scores range from 300 to 850, the data comes from Experian. The national average ends up being 673, this is kind of shocking to me since my banker seemed to stress the necessity of a 720 credit score to get a loan with the best rate. Obviously, not everyone owns their home, but even in the state with the highest average – Minnesota – the average is only 706.5. Even then, the state ranks a full 7 points ahead of the runner up – Wisconsin. Someone has to bring up the rear and for this metric, that someone is the state of Georgia, with an average credit score of 642. At first glance, the aspect that pops out the most is that the top four states are all bundled in the upper Midwest while 5 of the 6 lowest are basically neighbors in the south. What gives? 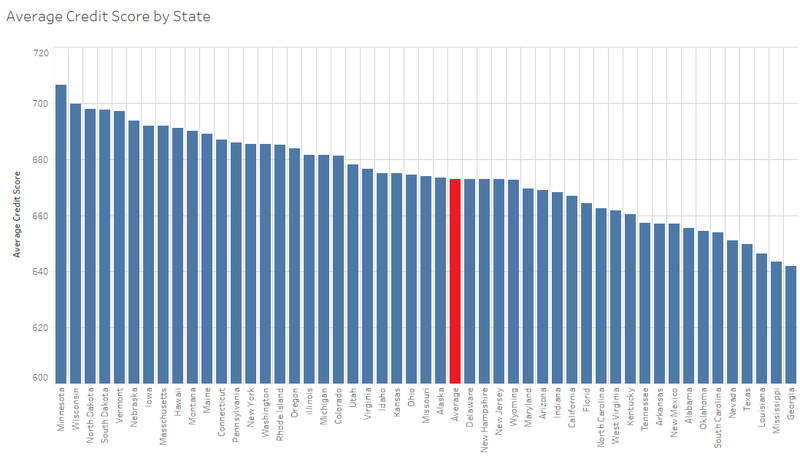 Unemployment rates play a large role in what a state’s average credit score will look like. As you might guess, the rankings sort of look similar, going further, looking at overall wages by state, things start to come into view a little better. High unemployment + low wages = lower than average credit scores. When credit scores get low, fewer people can qualify for a mortgage, which will usually lead to longer listing times and lower prices. It costs far more, on average, to buy a home in Massachusetts than it does in Mississippi, because of the demand and a larger pool of buyer from which to draw. One other thing to look out for elsewhere on the internet is misleading information about average credit scores. Like I said, I thought mine was average and it ended up being well above average – you can find your credit score here for free if you’re curious – but this data came straight from Experian. Data coming from other websites usually pull statistics from their userbase, which have a higher than normal propensity to have a lower credit score, throwing off their data completely.